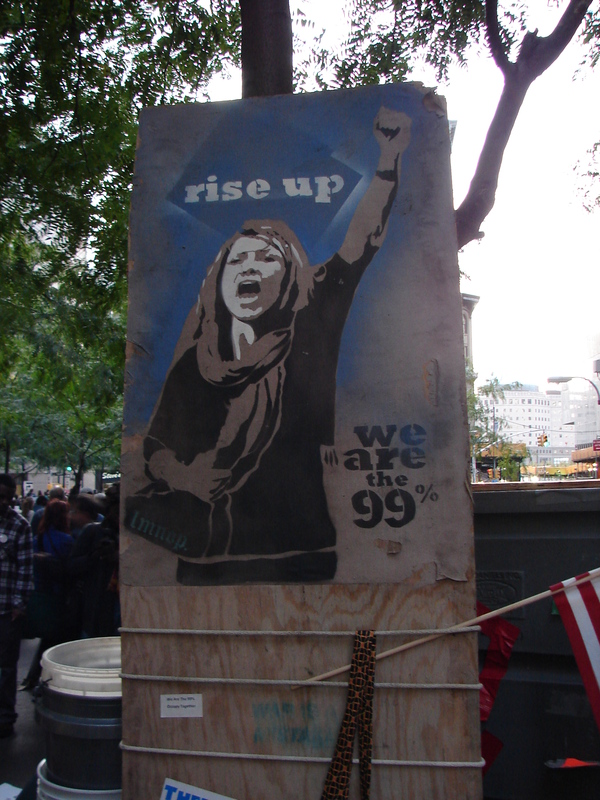 HOUSE NEWS: Roundtable on Occupy Wall Street this Thursday, and more! To see our full schedule for this week, click here. 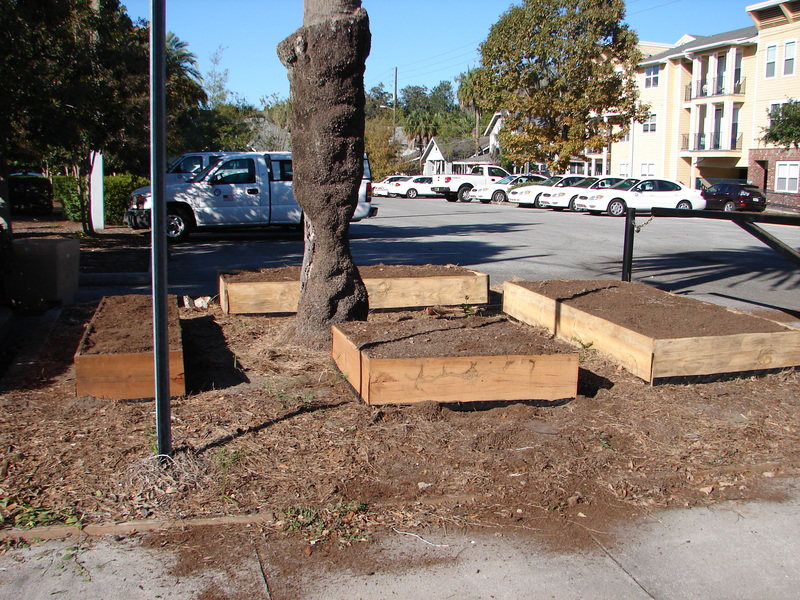 NEW RAISED BEDS ARE IN: Thanks to the folks who helped out two weeks ago, we now have our new raised beds in the parking lot garden, and have already set about planting. Broccoli and lettuce are in, soon to be joined by onions, mustard greens, kale, cauliflower and more. You can see photos of the process for putting the raised beds in by clicking here. We’re grateful to Travis and the folks at Florida Organic Growers, Grow Gainesville, the Grahams and others for helping get the new garden ready to go. Those veggies will be making it into our meals at the cafe very soon! FIRST THURSDAY ROUNDTABLE ON OCCUPY WALL STREET: This Thursday we’ll be hosting our monthly roundtable discussion and potluck, from 6:30-8pm, with our focus being on the Occupy Wall Street movement. We’ll discuss what’s going on, what issues are in play, what the movement might mean, as well as the intersection between the OWS movement and the teachings of our various faith traditions. If you can bring a dish to share, that would be great! NEED NEW CHEFS AND AFTERNOON VOLUNTEERS FOR CAFE: With the start of a new month, we’re looking for new “chefs-in-training” for the cafe on Wednesdays. Kelli will work with the new chefs in preparing meals for the cafe from local, in-season food, feeding upwards of 50-75 people each Wednesday. If you can commit to coming between 9:30-11:30am each Wednesday during November (excepting the Wed before Thanksgiving), we would love to have you! Just contact Kelli at our email address. Also, we’ve been a bit short on afternoon volunteers for the cafe in recent weeks. If you can join us for an hour or so anytime between 11:45am and 4pm, we’d appreciate the help. Thanks! Special thanks to the JustFaith group for providing food and drinks for Saturday’s football game! Hope to see some of you this week! For a full listing of what is happening at the house this week, click here. I was in New York City this weekend to speak at a conference, and Saturday afternoon I got the chance to join the Occupy Wall Street gathering happening at Zuccotti Park. Meanwhile, members of our household here have been participating in the Occupy Gainesville gathering at the Downtown Plaza, active especially on the food and comfort committee, bringing down a breakfast last week to the menagerie of folks who have found some unity within their diversity, i.e. “We are the 99%.” It is an unequivocally good thing that large numbers of people in towns and cities across our nation–and around the world this past Saturday in solidarity actions–are raising their voices against the class warfare which has been waged in our nation since at least the Reagan Administration. The bailout of corporations and banks during the recent recession is only the latest in a long line of indignities perpetrated against the impoverished and the spiraling downward middle class. The resources, wealth and power of our nation have been systematically transferred to and now are concentrated in the hands of a small minority–symbolically the “1%”, although the number is actually even smaller than that. As people of faith, we do not believe in a God that sanctions extreme wealth and extreme poverty. We believe in a God that has provided “enough” for all of us, and we are challenged to make sure that everyone has “enough” of what they need to live in dignity. At the GCW, our lives are radically opened to the real life suffering which is caused by the greed of the few over the need of the many. We support the effort of the Occupy Wall Street movement to unmask the injustice which is the result of a system rigged to satisfy corporate greed while ignoring human needs. 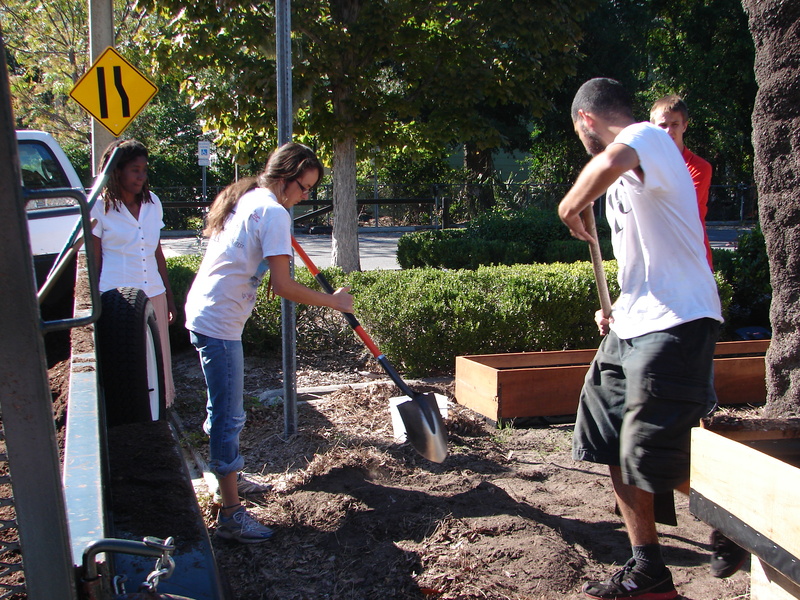 HELP US RAISE OUR GARDEN: On Friday, between 12:30 and 4:30pm, we’ll be preparing our new raised beds for the parking lot garden where we grow some of the food we use to prepare meals for our friends who visit the GCW. We need some volunteers willing to join us at 12:30pm at the GCW to shovel dirt into the truck and pick up the materials for the raised beds. We’ll also need some folks around 2pm at the GCW to help us assemble the beds and transfer the dirt out of the truck. If you can join us, please email us or otherwise let us know. SPECIAL BREAKFAST BRIGADES TO SUPPORT OCCUPY GAINESVILLE: In support of Occupy Gainesville, the new Citizens Co-op on Main Street has been accepting donations to help provide food for the folks gathered at the Downtown Plaza. We’ve offered our kitchen to help make a breakfast from the Citizen Co-op donations and deliver it to the plaza on Tuesday and Thursday this week, with prep to begin at 6:15am and delivery between 8-9am. We welcome anyone who wants to come anytime between 6:15-9am on these days and join us in this action. AND THE BEAT GOES ON: All of our regular projects–the cafe, Friday’s Breakfast Brigade, Art for All, Green House Knitters, Centering Prayer, and more–are in full swing, so please check out the schedule and join us whenever you can. We are so grateful to all of you for all that you share of yourselves to keep our projects going! Each semester, the GCW welcomes a new group of live-in community members as part of the GCW Semester project, an immersion experience for people interested in living and working at the GCW, exploring the link between faith and justice, experiencing intentional community, and more. This semester, we’ve been really blessed to have Tamra Rich, Daniel Loya and Vickie Machado as part of the program. 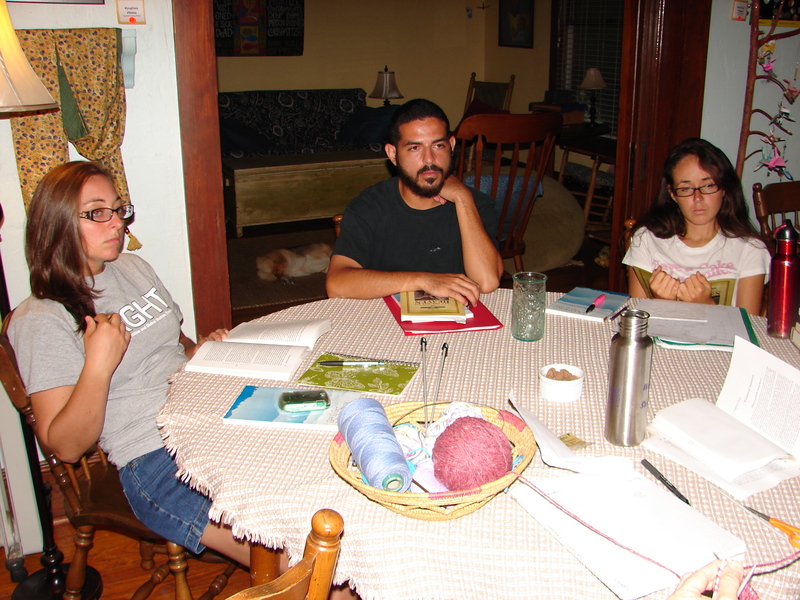 In the photo above, we’re at our Monday house meeting, studying the book, All the Way To Heaven: A Theological Reflection on Dorothy Day, Peter Maurin and the Catholic Worker by Lawrence Holben. For more photos of the 3 new community members, click here. HOUSE NEWS: Learn to crochet tonight! Blankets needed, and Roundtable this Thursday! To see all of what’s happening this week, click here. I was just thinking how nice it is that all of these emails/web updates always start out the same. Living at the GCW is an immersion in “giving thanks,” and doing these emails/web updates reminds me of that every week. I spoke to a group of young high school students this past week, justice leaders from Edmund Rice Christian Brothers high schools all across the nation (and in Latin America too!). We talked about the importance of advocacy, what is essential to justice, and why we are called as people of faith to work for social change. One of the closing lines I shared with them was this, which I have heard attributed to a number of different folks throughout the years: “What we cannot do it alone, we can do together.” The GCW reminds me of this every week–none of us could do this alone, but together we can. And for this, I give thanks. So thanks to TiAnna, Ida and Sarah, who so kindly provided a veritable feast for our small but hungry group of football game watchers on Saturday night. About 12-15 of us gathered throughout the night and the veggie pizza, sausages (yes, if you didn’t make it, you missed one of those rare times when meat was in the house! ), Southwestern dip and chips, and homemade cookies really hit the spot! Thanks too to all of our regular volunteers throughout the week, especially you courageous souls that get up and trek over here for Breakfast Brigade each Friday morning! TONIGHT – LEARN TO CROCHET! Tonight, Monday, at the Green House Knitters, there will be a “class” for folks who want to learn how to crochet. Things start at 7:30pm. LIVING MINDFULLY ROUNDTABLE: Thursday night, beginning at 6:30pm, we’re excited to have University of Florida professor Whitney Sanford and graduate student in religion Vickie Machado (our very own) co-leading the monthly roundtable discussion on “Mindful Living”. They will lead the conversation with Dr. Sanford’s current work with Gandhian intentional communities as well as Vickie’s summer experience with the environmental faith group, EcoStewards. Hope you can join us! Please bring a dish to share if you can! MORE ART FOR ALL: This week will be another double dose of art on Saturday, 1-4pm. We’ll have artists on hand to teach multimedia collage and how to make paper crane christmas ornaments. COALITION OF IMMOKALEE WORKERS IN TOWN: The CIW is in town to promote their anti-slavery work with their Museum of Modern-Day Slavery. The group is staying with us at the GCW and we hope y’all will get a chance to connect with them this week. Today they are at UF at the Plaza of the Americas, until 5pm, then a presentation in CSE E222. On Wednesday, they’ll be at Santa Fe College, 9am to 5pm at the Library, with presentations with Santa Fe professors taking place between 11am and 2pm. You can learn more about the CIW by clicking here. Also, if you have extra blankets, with the dip in temp, some of our folks who live on the streets are starting to think about being prepared for serious cold weather. We typically give out several hundred blankets over the course of the year; if you can drop some off at the house, we would be grateful. Thanks everyone, and we hope to see you this week at the GCW!